We are currently growing and maintaining nearly 13,000 native and endemic island plants as part of our current restoration project. These plants were grown from seed and cuttings collected exclusively from the island under the watchful eyes of our Nursery Manager, Kelle Green and Nursery Assistant, Sarah Spellenberg. It has taken the dedication of thousands of staff and volunteer hours to successfully propagate, grow and maintain such a large number of plants at an isolated island nursery 60 miles off shore. January brought another busy planting season on San Nicolas Island for Channel Islands Restoration! In just one month, over 1,000 nursery-grown native species were planted to help with erosion control, expand populations of rare plants and animals. that were installed early this year. CIR, in partnership with the U.S. Navy, has two upcoming multi-day planting trips to San Nicolas Island in January 2016. CIR will be recruiting a select number of volunteers for the chance to visit the most remote of the Channel Islands, and the hardest for civilians to visit! The goals for the two restoration trips will be to install 1,000 native plants (which includes two dune species) and replenish the island with native and island-endemic vegetation. CIR collected seeds on-island and grew the plants in the island nursery that was rebuilt by CIR staff and volunteers in 2012. CIR nursery manager Kelle Green and volunteers has been tending the native plants in the nursery, and they are almost ready to be planted.
) a California rare and threatened species. needle grass, box thorn, and cactus. Volunteers fly out of Point Mugu Naval Air Station to the island where they will stay in motel housing while working on this important restoration project. five and six days in length. This allows more time for volunteers to enjoy an extraordinary experience and beautiful island views. CIR staff and volunteers will be kept very busy planting and caring for these precious island plants in the coming months. Watch for the upcoming volunteer announcements! To date, Channel Islands Restoration has installed 2600 nursery-grown native plants on San Nicolas Island with several thousand more to go! Starting in December, our first volunteer planting crew put in plants that would augment habitat for the Island Night Lizard. This species is endemic to only three of the eight Channel Islands. The lizard was recently removed from the endangered species list because of conservation efforts led by the Navy on San Nicolas and San Clemente Islands, and by the Park Service on Santa Barbara Island. Navy staff on San Nicolas have designed a project to enhance the habitat of the lizard by planting species the lizard is known to favor. This includes California box thorn and two species of native cactus. In the wild, these thorny plants grow in impenetrable thickets that protect lizards from predators. The plantings have also been designed to help control erosion. Volunteers wore heavy leather gloves and handled these thorny species mindfully, using hand tools such as tongs to gently position the cactus. CIR propagated these native plants from seed in the island nursery that was rebuilt by CIR staff and volunteers in 2012. Our latest round of plant propagation was performed under contract with the Santa Barbara Botanic Garden and a Navy contractor. CIR nursery manager Sheri Mayta and our dedicated SNI field team of volunteers including: Carol Gravelle, Doreen Jones, and Dennis Kulzer have been tending the nursery and watching over the plants as they matured. Now that they are being planted in lizard habitat, our field team has expanded to include Kelle Green and Jon Huber, and will help to keep them watered and weeded as they become established. CIR staff and volunteers will be kept busy planting and caring for these precious island plants in the coming months. Watch for upcoming volunteer announcements! CIR grew the plants in the island nursery that was rebuilt by CIR staff and volunteers in 2012. 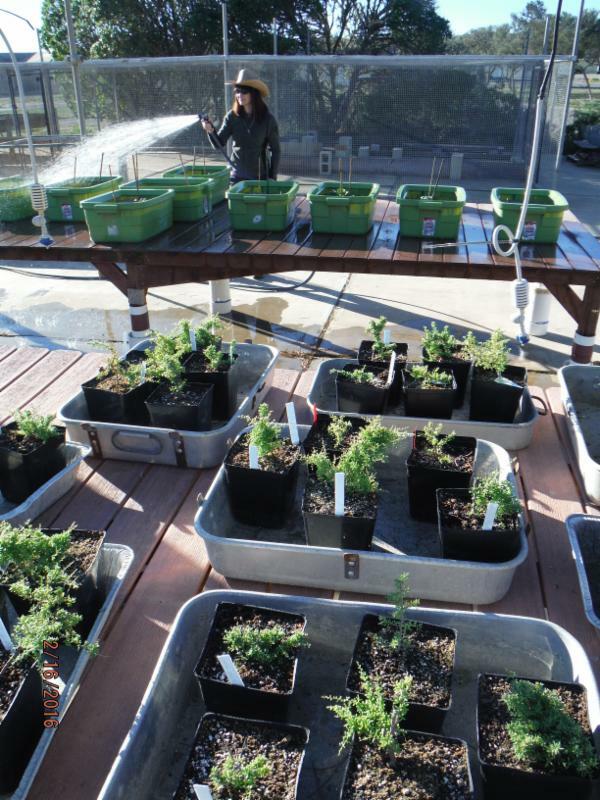 This latest round of plant propagation was done under contract with the Santa Barbara Botanic Garden and a Navy contractor. Channel Islands Restoration will grow at least 3,000 plants on San Nicolas Island in 2014, which will be used to restore habitat for the endangered island night lizard. We will also return to our ongoing project of removing invasive plants in sensitive habitat occupied by rare native plants. In 2012, CIR constructed a native plant nursery on the island and grew and planted more than 1,200 plants for an erosion control project on the eastern side of the island. , a threatened plant in the Borage family. Sahara mustard is a highly invasive plant that has caused great ecological damage in the deserts. The U.S. Navy is committed to controlling or even eradicating the mustard from the island and to supporting the recovery of the island night lizard. CIR donated much of our staff time to the eradication project over the last several years. The island night lizard, which is found on only three of the Channel Islands, thrives in native plants like prickly pear cactus and boxthorn. CIR will grow several species in the island nursery that are important to the recovery of the lizard habitat. Volunteers will help remove the invasives and will help with growing the plants. These projects would not happen without the help of volunteers, but the logistics of taking volunteers to islands owned by the Navy are complicated. Each volunteer must undergo a background check and obtain a pass before they can enter the Point Mugu Naval Air Station, where we board flights to the island. Once on the island, volunteers stay at motel-like housing, at the volunteer’s expense. Although this can add up to nearly $200 per trip, for most volunteers the price is well worth it. Volunteer opportunities on the Navy islands are rare, and San Nicolas Island is a particularly interesting place to visit. In 2013, CIR made several trips to the island to remove invasive plants. Carnation spurge is quickly spreading in California, and the Navy hopes to eradicate it from San Nicolas Island. CIR is proud of our partnership with the U.S. Navy on San Nicolas Island. We also work closely with ACS Habitat Management and the Santa Barbara Botanic Gardens on the San Nicolas Island projects. Although CIR has received funding from the Navy to work on all of these projects, we have also donated many thousands of dollars in staff time when funding has not been available.
) in sensitive Coreopsis scrub habitat. This is the second trip for CIR this year to work on this project, and the third year in a row that CIR has worked on this project. The Mustard is a highly invasive, non-native plant that has caused a great deal of destruction to native habitat in the deserts and other environments in California and elsewhere. The Navy is working to keep the mustard from spreading on San Nicolas, and CIR has been removing it where it grows around some rare plants. San Nicolas Island is owned by the U.S. Navy, and Channel Islands Restoration is under contract to do habitat restoration on the island. Endemic foxes live on six of the eight California Channel Islands, and there is a healthy population on San Nicolas Island. Channel Islands Restoration staff and volunteers always see foxes when we visit the island to work, and this last trip was not exceptions! This Island Night Lizard was seen by Channel Islands Restoration volunteers on our resent trip to San Nicolas Island. Island Night Lizards are found only on San Nicolas, Santa Barbara, and San Clemente Islands. They have large populations on San Clemente and San Nicolas Islands, and they are still federally listed as an endangered species. This northern elephant seal (and many more) were seen by Channel Islands Restoration volunteers on our resent trip to San Nicolas Island. Elephant seals breed on the island. Elephant seals breed on the island. The photos above show Channel Islands Restoration volunteers hand-removing Sahara mustard on San Nicolas Island on our recent trip there.
) is the large, green plants with the yellow blooms. It grows in huge stands on San Nicolas Island and is the dominant plant in a community of plants called Coreopsis scrub. Cryptantha traskiae (a rare plant found only on San Nicolas and San Clemente islands) grows in the same habitat and is threatened by the spread of Sahara mustard. CIR volunteers have to be carefully tried to work in this sensitive environment and around rare plants. Giant Coreopsis in bloom on San Nicolas Island. Late February is the peak booming season for this plant on San Nicolas Island. Sand dune on San Nicolas Island (with giant Coreopsis in the foreground). The bloom of Giant Coreopsis. Giant Coreopsis is in the sunflower family. Channel Islands Restoration volunteers pose at Coral Harbor on San Nicolas Island. Channel Islands Restoration staff and volunteers teamed up with the United States Navy in April on San Nicholas Island to completely rebuild and expand an old native plant nursery. More than 1,100 plants have been grown so far, and CIR staff and volunteers recently planted most of these at a restoration site on the island. The nursery, which consisted of a shed and small planting benches, had fallen into disrepair over nearly two decades. CIR built new benches, erected a shade structure and installed an irrigation system. The three benches (each forty feet long and six feet wide) include custom designed “biosecurity” measures that prevent introduced pests like Argentine ants from infesting the plant pots. The nursery shed required major cleaning, and it will soon receive repairs to its roof and doors. Funding to build the new nursery and to grow the plants has been provided by the Navy. The nursery has an automated irrigation system, so CIR staff only needs to visit the island approximately once per week. The plants were installed at a restoration site on the eastern side of the island to help prevent erosion along roadside dune habitat. More plants will be grown in the nursery to revegetate sites impacted by upcoming construction projects on the island. CIR Board Member Gordon Hart designed the nursery and led the construction project along with volunteers Dave Edwards (also a Board Member) Don Mills and John Reyes. The plants were grown by Norma Hogan, who recently joined the CIR team. and most of these plants have been installed at a restoration site on the island. (a threatened plant in the Borage family). Sahara mustard is a highly invasive plant that has caused great ecological damage in the deserts. It has spread quickly on San Nicolas Island, and the Navy staff is committed to eradicating it from the island. CIR has donated the staff time on this project for several years, but the Navy has recently contracted with CIR to perform this service. Our staff and volunteers are trusted to work around these sensitive plants and around protected archeological sites. CIR greatly values our relationship with Naval Base Ventura County and the U.S. Navy as a whole. CIR staff and volunteers plant natives at the Thousand Springs restoration site on the north east end of San Nicolas Island. CIR volunteers plant natives at the Thousand Springs restoration site on the north east end of San Nicolas Island. Channel Islands Restoration staff and volunteers teamed up with the United States Navy in April on San Nicholas Island to completely rebuild and expand an old native plant nursery. More than 1,100 plants have been grown so far, and CIR staff and volunteers recently planted most of these at a restoration site on the island. The nursery, which consisted of a shed and small planting benches, had fallen into disrepair over nearly two decades. CIR built new benches, erected a shade structure and installed an irrigation system. The three benches (each forty feet long and six feet wide) include custom designed “biosecurity” measures that prevent introduced pests like Argentine ants from infesting the plant pots. The nursery shed required major cleaning, and it will soon receive repairs to its roof and doors. Funding to build the new nursery and to grow the plants has been provided by the Navy. The nursery has an automated irrigation system, so CIR staff only needs to visit the island approximately once per week. The plants were installed at a restoration site on the eastern side of the island to help prevent erosion along roadside dune habitat. More plants will be grown in the nursery to revegetate sites impacted by upcoming construction projects on the island. CIR Board Member Gordon Hart designed the nursery and led the construction project along with volunteers Dave Edwards (also a Board Member) Don Mills and John Reyes. The plants were grown by Norma Hogan, who recently joined the CIR team. CIR has been working on the island for several years eradicating Sahara mustard from habitat of the threatened Cryptantha traskiae (a threatened plant in the Borage family). Sahara mustard is a highly invasive plant that has caused great ecological damage in the deserts. It has spread quickly on San Nicolas Island, and the Navy staff is committed to eradicating it from the island. CIR has donated the staff time on this project for several years, but the Navy has recently contracted with CIR to perform this service. Our staff and volunteers are trusted to work around these sensitive plants and around protected archeological sites. CIR greatly values our relationship with Naval Base Ventura County and the U.S. Navy as a whole. and 1.25 acres of disturbed southern willow scrub on the Santa Clara River near Santa Paula. The goal of the project is to create and restore/enhance riparian habitat to increase wildlife diversity, including creation and/or enhancement of southwestern pond turtle habitat. This project is meant to mitigate impacts of the City's new waste water treatment facility. Work began in late spring of 2011. On the islands, CIR took nine elementary school classes to Anacapa and Santa Cruz Islands to learn about conservation ecology and to help with invasive plant removal. We did this with funding from several grant sources and we plan some more trips this fall. Holy Cross School in Ventura contracted with us to take them on a four day volunteer trip to the Nature Conservancy side of Santa Cruz Island. CIR is helping the U.S. Navy in a program to eradicate Sahara Mustard on San Nicolas Island. We would love to provide volunteer trips there in the future, and also to San Clemente island, perhaps as early as this fall. Stay tuned! !